ON THE STREET, MEN HAVE YELLED AT me, touched me, trapped me to talk to me and tried to get me into their cars. My stories are upsetting but common. Street harassment is the reality for women, non-binary, Trans, and queer people in the core. Indeed, downtown Edmonton has a street-harassment problem. I live here, and it’s impossible to go through a summer week without someone yelling at me or invading my personal space to try to force an interaction. And while this isn’t a new phenomenon, the way downtown is being developed means it’s growing. New developments are drawing more people downtown, and shifting some of the party culture away from Strathcona and into the core. What we need to do now is to get creative to find ways to increase awareness around how common this all is. Thankfully, we are starting to do just that. Locally, small efforts have been made, like the Transit safety campaign, which displays ads encouraging riders to look out for one another. But my favourite project so far is the This is What it Feels Like exhibit, at MacEwan University, which invited participants to step inside a dimly-lit booth while comments women hear yelled at them are played back to them. These kinds of projects give me hope. They let people know about the issue. Art is uniquely able to help us experience what it’s like to walk in another person’s shoes. Still, moments experiencing street-harassment can limit a woman’s life. They can dictate what we wear, where we go. It used to be that you had to expect this: Men are awful, we’re told, and it’s our responsibility as women to deal with that. Cover up. Don’t go out at night. Be a good girl. We have to do better than that for future generations. We have to because street harassment is more than just words, and it will take more than the government to solve our problems. When I tell men my stories of street harassment, the common refrain is that they have never seen anyone being harassed. Sometimes they have their own stories of dealing with drunk and boorish men and women. Sometimes, they say, they wish people would also yell ‘compliments’ at them the way I apparently get them. Sometimes, they ask what I was wearing. It is tough to have your experiences dismissed. That needs to change. It’s up to people to change their culture. 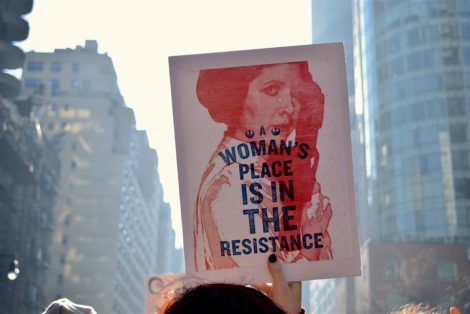 Women are speaking out in historic numbers about sexual violence. It is up to all of us to listen. Many years ago, when my youngest niece was a baby, I took her out and about to give her mom — my sister — a break. It was then I learned how difficult it is to move around Edmonton with a young child. We had the contraption where you strap the baby to your front torso and step out into the world as though you are a kookum out hunting moose (mine’s never hunted moose, by the way). But when my back couldn’t take it anymore I would bundle my niece up in a stroller. And then came the lessons. Have you ever tried to take a baby in a stroller on an ETS bus? It is awful. People roll their eyes before (or if) they make room. Even worse, just getting to the bus stop can be difficult because you have to navigate puddles, people and deteriorating sidewalks. So, between the clunky stroller barely fitting our often narrow, often poorly-lit sidewalks, the bus challenges and the cat calls — yes even while pushing a baby stroller — I came to realize that Edmonton is not designed with all women, mothers or caregivers in mind. But who are cities like ours made for, then? It helps to look at who it works best for. Mo Bot, an urbanist who works as a planner for the City of Edmonton, is passionate about the concept of universal design. Bot says different groups use city infrastructure differently. Take the bus, for example. “Studies [have] found that men tend to take the bus twice a day — to and from work,” she says. Women, on the other hand, tend to use public transit with far more variance, and tend to make more trips on foot, too. Bot says they do something called “trip chaining,” which essentially means they often make multiple stops while riding the bus between home and work. You know, to pick up the dry cleaning, then the kids from school or the doctor, and then the groceries. What matters here is whose life you make harder if you design, say, a transit system that works only for your city’s purely work commuters (a majority of whom, in this case, are men) and not its many other users. I can already hear the “But-what-about-the-men? !” cries. Yes, parenting can be done by any gender, and there are more than two binaries to consider when discussing universal design. But the point is if you make a city accessible to everyone you’ll make it better for everyone. The question is how. And this was Kalen Anderson’s point for her recent Pecha Kucha presentation on urban design. She says core neighborhoods are the most important places in the city. “They need to provide holistic opportunities for people to live.” But, Anderson says, Edmonton’s core is not doing that well enough at the moment. “If you want to see how a community works look no further than the way it welcomes children,” she says — noting the core could well improve on that front. My trips with my niece taught me about the importance of bus seating, wide sidewalks in good repair, better lighting. City design should serve those caring for children, or those with different abilities or of different ages, just as equally as everyone else. Should our downtown and core neighbourhoods welcome kids and families? It’s a question that’s about to get messier than a playpen in Alberta. As you may have read or experienced, in Alberta a landlord can still refuse to rent to tenants with children, and a condominium board can still evict an owner (yes, an owner) or resident who contravenes an adult-only building bylaw by having the audacity to get pregnant. Ouch, right? Well, it depends who you ask. Many Albertans opine that kids disrupt what’s apparently guaranteed to be a placid condo lifestyle — or so social media commentary suggests. And as these commenters often add, what parent would choose to raise their child in a downtown apartment or condo, when we have perfectly nice suburbs, exurbs and bedroom communities for that? The conversation about where kids and families belong in Edmonton became heated this spring when, in April, the Child Friendly Housing Coalition of Alberta (CFHCA) launched a campaign to end age based discrimination in housing. The group had its eye firmly on areas like Oliver and downtown, which see large amounts of multi-unit apartment and condominium housing and often, child-blocking age restrictions applied to that housing. The group has been spurred to act by a January 2017 high court decision that, by next year, will see Alberta become the last Canadian province to add age as a prohibited ground of discrimination. The province also has until next year to decide which age discriminations it will uphold (think needing to be 16 to drive, 18 to drink, and so on). Some developers and industry advocates are hoping the government keeps adult-only housing as one form of legal age discrimination. Aside from the laws, however, what many seem unable to grasp is the choice bit. Some of us choose to live downtown or in Oliver because we prefer that to other options. We’re not just saving up for the ‘burbs, and we might also want to have children while living here. But when it comes to choice, there’s often little of it in downtown and Oliver for housing that’s usable for a family (three bedroom apartments, condos or townhomes) in Edmonton. Raj Dhunna, CEO of Regency Developments, told the National Post in April that the cost to build townhouse units—for example, three bedroom, multi-unit housing—puts their price uncomfortably close to what a buyer can find a single-detached home selling for in a greenfield suburb. Dhunna said that made these units hard to sell, and that’s why he and other developers don’t really build them. As a 30-something millennial who’s lived in an apartment her entire adult life, I’m always perplexed by arguments like Dhunna’s. They assume all consumers make housing choices based solely on economic factors, rather than a web of social, economic, transportation and lifestyle preferences. They also assume we will always choose the suburbs in lieu of the urban life that we love, if they’re cheaper. Such comments also plunge me into selfdoubt. By still living in an apartment, am I pathetically trying to extend my youth? Do I lack the gene that allows other adults to enjoy lawn care? Hard to say, but I don’t seem to be an outlier. A shift to investment in urban areas like downtown and Oliver can only work if people of all ages are welcome. That must include parents, kids and families. If you agree and want to end discrimination against children in housing, there’s now a group you can add your voice to. Chelsey Jersak lives in one of downtown’s kid-friendly condos. She’s the founder and principal of Situate, a municipal planning and placemaking firm, and a founding member of CFHCA. For more information, see cfhca.ca. Will Edmonton Seriously Enforce Noise Bylaws Against Loud Motorbikes? Living in the core, you expect a little noise. But Edmonton’s roads can sound like a speedway when drivers, and especially motorcyclists, feel compelled to stunt with pimped out rides, leading recreational vehicle users to clash with patio patrons. As Edmonton improves the core’s walkability and street life, community members and a determined city councillor want exhaust pipes to pipe down. “Patio culture can add so much to an urban area,” says Coun. Scott McKeen. “If cruising noisy vehicles take away from that it’ll impact the area and it success.” Loud vehicles aren’t just disturbing the patio peace, but young families, seniors residences and those catching sleep after a night shift, he says. Edmonton implemented a noise bylaw for motorcycles in 2010. Vehicles must not be louder than 96 decibels while driving. EPS has a sound level meter that captures levels provable in court. But enforcement of noise complaints is not an easy process. Police are aware of the problem spots, such as Jasper and Whyte avenues, but they can’t respond to individual complaints, and instead will set up zones to test vehicles. “There [needs to] be better enforcement of noise issues on Jasper,” says Dustin Martin, civics chair with the OCL. In a presentation to the police commission in January this year, Insp. Dennis Storey admitted the major collisions investigation unit, which was conducting noise enforcement, didn’t have the resources to address noise, let alone the unit’s main focus of major collisions. Only 175 violations were enforced by police in 2015. This year, EPS trained 25 more officers to deal with noise violations and has stationed those officers throughout the city, which shifts enforcement to a neighbourhood-level approach. McKeen says this shouldn’t be a police priority. Instead he’d like to see bylaw officers’ powers expanded in the Municipal Government Act. “Any patrol officer or peace officer should be able to write an order on the street to say you have to appear within the next two weeks and have your bike tested,” says McKeen. 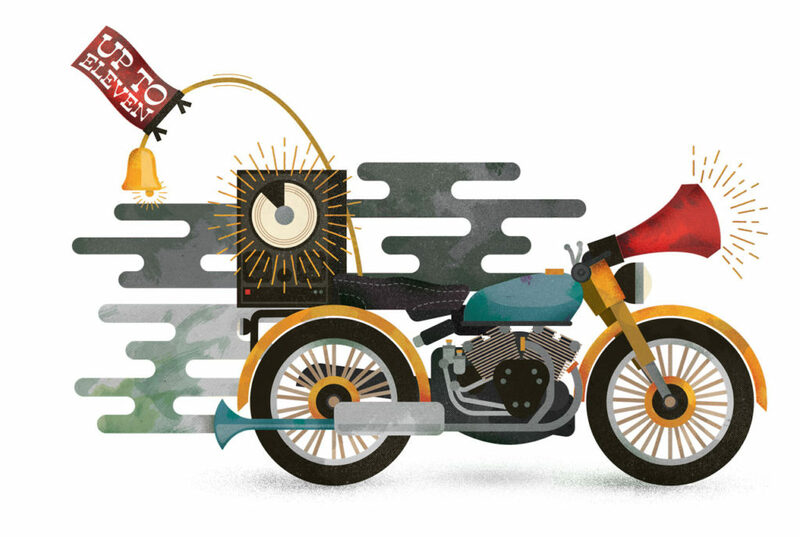 Many motorcycle riders argue that loud pipes are necessary for safety—to let bigger vehicles know their comparatively small presence—but not all will agree that noise is a necessary part of riding. “High visibility trumps loud pipes for safety,” says Ricardo Dominguez, a local rider of six years. He says the pipes are useless because they point backwards, not forwards, toward the traffic it’s approaching. The Oliver Community League and Downtown Edmonton Community League would like to see a public education campaign on the effects of noise. They also want traffic planning to constrain riders’ speed in the core—and thus their noise—by timing street lights in a way that doesn’t turn them green for blocks on end, and by better emphasizing cyclist infrastructure and pedestrian crossings as road-calming measures. Over 1,400 Syrian refugees have moved to Edmonton since November and at least 1,000 more are to come. To help them settle, community-based groups like DECL and All Saints’ Anglican Cathedral are pitching in. “In dire times, we’re called to help [anyone] regardless of race, religion or anything,” says Chris Pilon, community engagement coordinator of All Saints’. 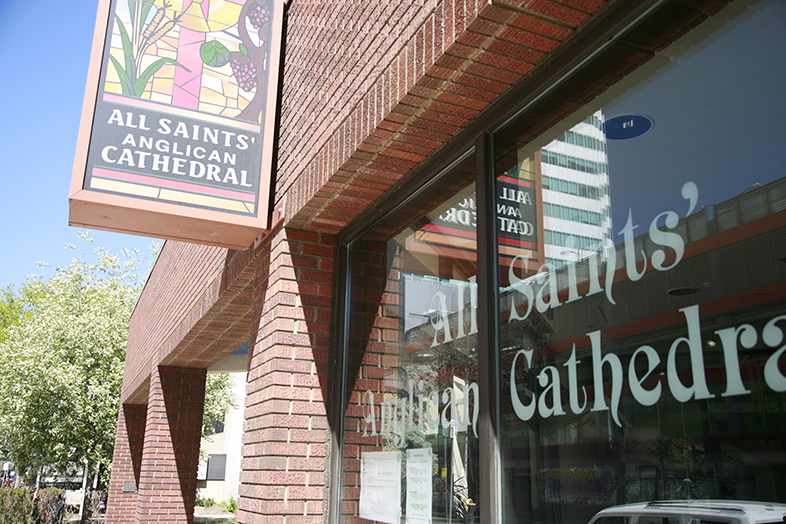 All Saints’ will soon assist one Syrian family. The church formed a sponsorship steering committee, and has raised about $45,000 to sponsor the family for a year. Equally valuable are the dozens of volunteers ready to greet them, arrange medical appointments, help with job hunting and so on. DECL also informally approached the church in fall 2015 about its planned response to the Syrian crisis; it’s committed to participating in any suitable capacity. The chief concern for arriving refugees isn’t integration but navigation, says Pilon. Understanding housing, utilities, transportation, banking and schools in Canada’s comparatively bureaucratic society is complex. These hurdles can overwhelm anyone, and immigrants often have a limited grasp of English, which makes navigation harder. Even after short-term necessities are managed, refugees face ongoing challenges. They may worry about how to support their families after the sponsorship ends. Pilon, who is also a DECL board member, says community leagues play a vital role in assisting refugees because their members are naturally passionate about their communities and want to share them with newcomers, whether from Syria or St. John’s. 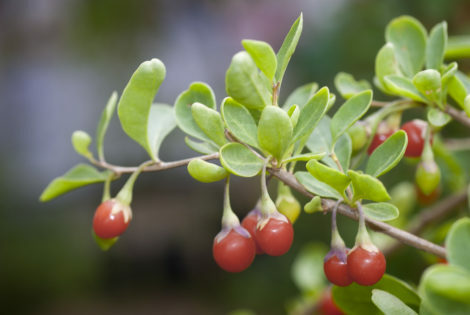 They also have connections to organizations, business owners and other resources that make them valuable sources of knowledge. The North Glenora-sponsored family is a multi-generational family from Aleppo— four adults, three teenagers and six young children. They lived in a Lebanese camp for over two years after fleeing Syria in 2013, following an explosion outside their home. Laws restricted the adults from working, so the young boys took to selling paper on the street to support their extended family. They arrived in Edmonton in February, but the eldest daughter, her husband and their two children remain in Lebanon. Nash’s group is working with another community-based group in Glenora to reunite them. To show their appreciation, the family recently bought, butchered and cooked a goat for a thank-you dinner. Pilon looks forward to the day he can see All Saints’ sponsored family comfortable, confident and beginning to feel at home in Edmonton. He hopes to meet them at a local event, not as refugees that the church sponsored, but as “fellow Edmontonians” who ventured out independently to enjoy their community. After two failed attempts at securing a new home, Greyhound is attempting to lease space from Via Rail’s northwest location, an area without transit service. As the city has increased its focus on accessible transit, the relocation of central Edmonton’s intercity transport hub has some thinking that it’s a move in the opposite direction. “I’m worried about people who would be stranded,” says Coun. Bev Esslinger. 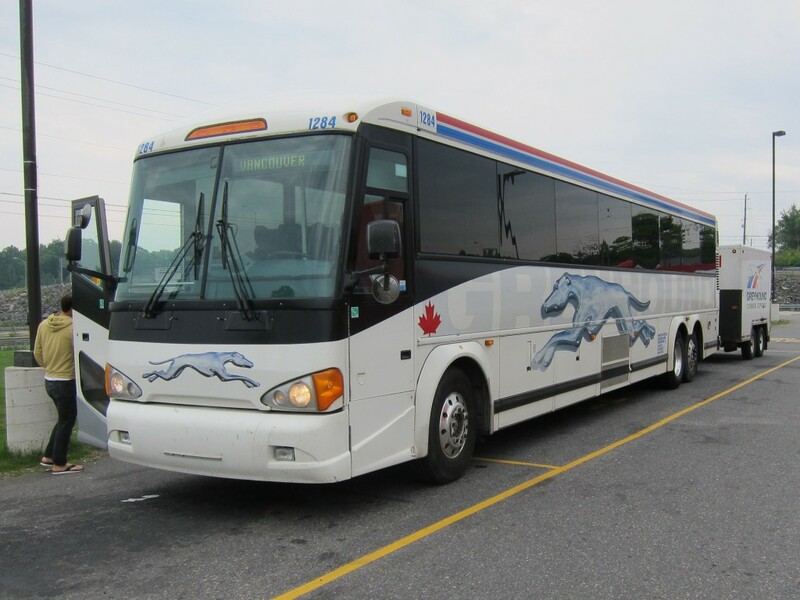 Greyhound customer surveys show that 40 per cent of riders have daily access to cars, and the same percentage of riders are from households with an income under $25,000. The Via Rail site would leave passengers with cabs or Uber as their only options. “When you move it away from major bus routes, of course you make it a lot more difficult for people to catch the bus,” says Boyle Street Community Services outreach worker, Colin Inglis, who has worked in the core for five years. He says the lack of intercity transit affects people’s ability to access treatment centres outside the city and for low-income people in rural areas to access services such as health specialists, or to simply visit family. Downtown Business Association executive director Jim Taylor agrees that the biggest hit to moving the station is to riders in need of service, but not surrounding businesses, who could take advantage of transportation or courier services. “It’s going to be a difficult thing for Greyhound riders to facilitate the kind of connection they need once they get in the city,” says Taylor, who says most business people travel on Red Arrow. Greyhound itself would prefer to stay downtown. But increasing rent and the required footprint makes it impossible, says Peter Hamel, Greyhound regional vice president. The company sees its Winnipeg location as a model in creating a “downtown touch point.” It maintained a satellite passenger drop-off point downtown since moving the station to the inter-national airport, seven kilometers away. Esslinger says any new location should have a downtown shuttle service. But right now there’s no consideration for public transit. Esslinger says the city can’t prioritize it over other projects. “We have a whole long list of people in new neighbourhoods waiting for transit sites,” she says. Greyhound is currently dedicated to partnering with Via Rail on location, says Hamel, as well as with the City on downtown kiosks or drop-off locations. As the summer sun sets, the crowds that blossomed in Churchill Square blow their seeds west, to an L-shaped strip that comes alive every fall with the vast majority of downtown’s 30,000 students. Following the marketing trend of “district-ifying” downtown (Ice District, Warehouse District, etc. ), Norquest College, one of 10 post-secondaries within this region, has nick-named it the Education District. But you don’t need official demarcation to see this district take shape. These colleges are quickly developing new campuses, parks, student housing and parking garages to accommodate a student population set to grow by nearly 40 per cent, according to the Downtown Business Association. What’s this mean for the future of our neighbourhoods? Find out on p. 19, where recent MacEwan graduate and VICE Media writer Mack Lamoureux investigates. As a bonus, he shares with the next cohort of Oliver and Downtown pupils what he knows about finding cheap rides, food and beer. Even if your keg-stand days are over, it’s never too late to pursue some form of learning. 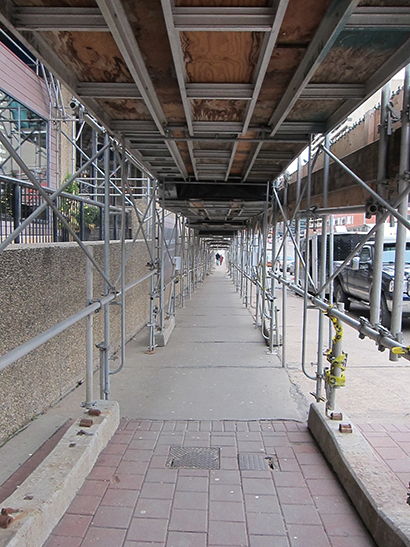 This fall begins the lengthy process of remodelling the Oliver side of Jasper Ave. and potentially transforming it from a seven-lane thoroughfare to a pleasant promenade. I say potentially, because it depends on what residents want. Our cover story (p. 14) looks into the problems and possible solutions for our main street. Maybe civics isn’t your cup of higher education. What about whiskey tasting and printmaking? I doubt you’ll snooze through the list of casual classes assembled for you on p. 8. It’s written by Brittany Nugent, who, like Lamoureux, is a MacEwan talent and downtown neighbour. Same goes for Jyllian Park (“Man About Downtown”; p. 7) and Allison Voisin (“The Human Touch”; p. 12). These four writers—pulled to our neighbourhood for an education, now helping us see it differently—show how making Downtown and Oliver a student destination could enrich it for everybody. That’s probably not what comes to mind when you think of the students next door. One’s more likely to wince at the late-night revelry and fast-food restaurants that will follow—and no doubt they will, and already have. But I, for one, welcome the next generation to our core neighbourhoods. Not just because they’ll offer much needed vivacity to our public streets at night, but because they may also be the next generation of Edmontonians. Maybe by immersing themselves in the city centre, instead of being segregated in a traditional university campus, they’ll see Edmonton’s inner-workings, grow attached, and stick around. In a world where cities compete amongst each other for global talent, creating an environment in which they want to hang up their hats—and degrees—could be to all of Edmonton’s advantage.